The Columbia Club is important in the political and social life of Indianapolis and the state as the leading gathering spot for supporters of the Republican Party from the 1890s to the present. The clubhouse is another significant work from the Rubush & Hunter firm, leading architects in the city in the early 20th century. Its exterior design combines French and English Tudor Gothic influences, as well as fine art in the form of carved relief panels. The origins of the club extend to 1888, when fellow Republicans formed a group to support the candidacy of Benjamin Harrison for president of the United States. The club officially incorporated in 1889 after Harrison’s successful bid and developed into one of the leading men’s social clubs until women were admitted in 1979. In 1924, the Columbia Club hired Rubush & Hunter to execute plans for a new clubhouse. The group razed the 1898 building they had built and began construction of this 10-story limestone building on the northeast quadrant of Monument Circle. Throughout its history, this clubhouse has hosted every Republican president while in office or afterward, as well as scores of nationally famous political thinkers and office holders. Rubush & Hunter designed the club to contain guest hotel lodging, dining rooms, meeting rooms, reading areas, and club offices within its concrete frame. The exterior style combines Late Gothic and Early Renaissance elements. The multi-story oriel window with banks of leaded glass casement windows is the dominant feature. Architectural sculptor Alexander Sangernebo carved the limestone relief panel over the windows, at the base of the oriel, and in the tympanum over the main entrance. Diagonally across Monument Circle at 20 North Meridian stands the Guaranty Building, a 9-story speculative office building, again by the architectural team of Rubush & Hunter, with Sangernebo providing the classical stone carvings for the facades. 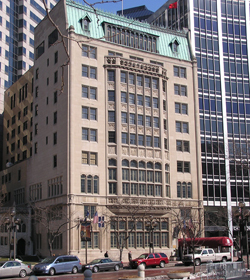 The Columbia Club is located at 121 Monument Circle. The club is private.